The 22-year-old Iraqi suspect in the Chemnitz stabbing, identified as Yousif A., was released by the German authorities on September 18 after being held in detention for about three weeks. Yousif's lawyer, Ulrich Dost-Roxin, referred to the lack of evidence and threatened those who arrested the young Iraqi with legal action. "What is seriously wrong in this case is that the executive authority and the justice system have trampled on the presumption of innocence for weeks," the lawyer highlighted, as quoted by Deutsche Presse-Agentur (DPA). Yousif A. and another suspect, a 23-year-old Syrian man referred to as Alaa S., were held in custody in connection with the stabbing and killing of a 35-year-old German citizen, Daniel Hillig, on August 26. Last week, the NDR reported that Dost-Roxin requested for the withdrawal of the arrest warrant due to the fact that it contained "limited evidence of involvement" of his client. Earlier, Yousif testified that he had been present at the crime scene, but only watched the actions of others. Witnesses confirmed his words to the police. Addressing a press conference on Tuesday evening, a spokeswoman of the Chemnitz State Prosecution Office announced that the warrant for the arrest of Iraqi Yousif A. had been canceled. "A series of clues first indicated that he was involved in the murder of Daniel H. Therefore, at first an arrest warrant was issued for him," she specified. The spokeswoman pointed out that witnesses told the police that the blows were inflicted by two individuals, independently from each other. Two men were detained. Later, the police discovered a knife. According to her, while it was recognized as a weapon of murder, no traces of DNA were found on it. Meanwhile, the Chemnitz police believe that a second knife, involved in the stabbing case, will be found. The Chemnitz State Prosecution Office noted that the investigation against both "for causing minor bodily harm continues." While the first suspect now walks free, the second one, Alaa S., will remain in custody under a ruling of the Chemnitz court. Furthermore, the charges against the Syrian, who, presumably, dealt a lethal blow to the victim, have been toughened. "The witnesses identified him as a person carrying a knife," the prosecutor's office spokeswoman said. "According to information at the moment, the prosecutor's office proceeds from the fact that the Syrian and another unknown person participated in the joint homicide." She added that an international arrest warrant had been issued for a third suspect, who participated in the crime. 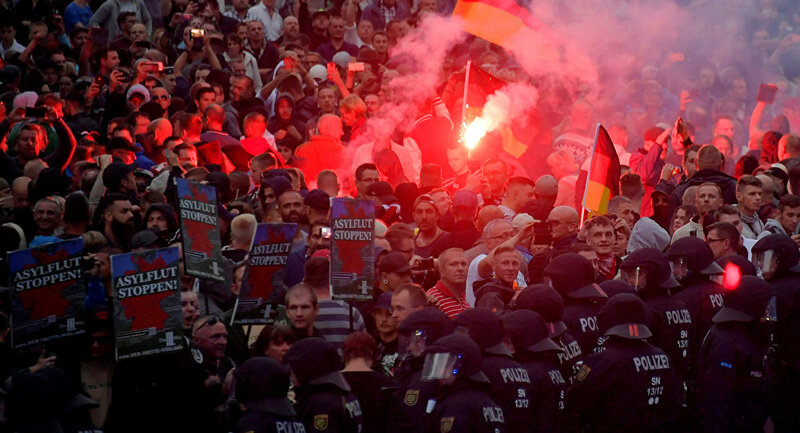 The stabbing case sparked nothing short of mayhem in Chemnitz. On August 27, two demonstrations were held in the center of the city, an anti-Nazi rally and a protest organized by the Pro Chemnitz movement. 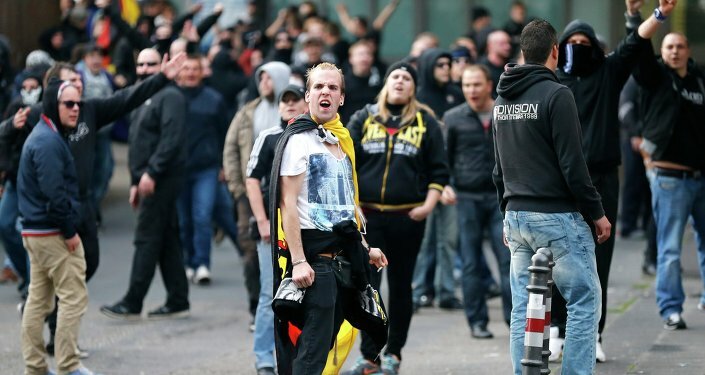 Right-wing protesters called upon the government to deport all illegal immigrants from Germany. According to some estimates, 18 people, including three police officers, had been wounded during the Chemnitz protests, while hundreds of demonstrators had been arrested. Commenting on the event, German Interior Minister Horst Seehofer, an ardent critic of Angela Merkel's refugee policy, admitted, speaking to the Rheinische Post on September 6, that he would join the protests in Chemnitz if he were not a minister. "There is a lot of … outrage in the population about this murder, as I understand. If I were not a minister, I would have taken to the streets as a citizen, of course, not together with radicals," the interior minister underscored. Since the eruption of the European refugee crisis in 2015, Germany has absorbed more asylum seekers than any other EU country. However, Berlin's open-border policies have triggered growing discontent among the country's population, which claims that the security situation in Germany has seriously deteriorated in recent years.